What’s really driving the PATH airport extension? So little for so much: A possible route for the PATH’s $1 billion extension to the airport. A few weeks after hearing once more about the Port Authority’s on-again, off-again plans to send the PATH train to New Jersey, a new story in The Wall Street Journal has me wondering about the impetus for such an extension. New Jersey Governor Chris Christie wants one thing while Newark is angling for another reason, but the cost and planned connection — to airtrain and not the airport itself — should raise more than a few eyebrows. In talks with United Airlines, the Christie representatives have suggested that they would direct the Port Authority of New York and New Jersey to begin a long-contemplated extension of the PATH train to Newark’s airport rail station, providing a long-desired direct rail link with Lower Manhattan, these people said. In exchange, these people say Mr. Christie, via Port Authority Deputy Executive Director Bill Baroni, has asked United to provide service to a slate of cities from Atlantic City—a small airport with a spotty track record of supporting commercial service. United is the dominant airline at the Newark airport, carrying about 70% of the passengers. Since word of the Port Authority’s move to consider the extension leaked a few weeks ago, the back-and-forth has been confusing at best. An event planned for mid-September was canceled shortly after the original Crain’s article appeared, and Newark officials are pushing for the extension because it would benefit its residents seemingly more than anyone else. Still, this latest story raises a few questions. Maybe sending PATH to the airport is a good, worthwhile idea that can help ease travel to Newark; I’m not saying it isn’t. But a half-baked proposal that costs too much and is being put forward for purposes of a trade-off likely isn’t the right answer. Meanwhile, the Goethals Bridge replacement project is moving along at a glacial pace, and what’s up with the Bayonne Bridge raising? Wasn’t that supposed to be completed by 2014? Guess those $12 tolls are needed to finance a rail line to Newark Airport even though one already exists. The feds were holding up the Goethals. Schumer has actually done some yeoman work in getting them to cough up their permit, which was accomplished last week. Construction should be starting imminently. Yes, it’s 20 years late and inadequate, but it’s finally starting. The enviros are suing over the Bayonne Bridge raising, not sure if that suit is affecting the construction schedule. The primary reason why PANYNJ’s tolls are so high is because they need the money to cover the cost overruns of building the new World Trade Center. The projects for the Goethals and Bayonne Bridges have little to do with it. It’s not a billion dollars in state money. It’s a billion dollars of PA money which comes in from fares, fees, and tolls. I think that is a mistake that often gets made when discussing the Port Authority and PATH. Yes. That’s true. It comes from a variety of sources, but a billion dollars is still a billion dollars. Does a $1 billion extension to the AirTrain terminal make sense without direct service to the airport terminals or would restructuring fares on New Jersey Transit between Newark-Penn Station and the EWR stop make more sense? The Port Authority really wants that extra AirTrain fare for your transit trip to the airport at both JFK and Newark. In both cases you can take local buses to the terminals themselves to avoid the fee, but I don’t see why anyone involved would want to promote a rail link that avoids it at Newark. If they built a PATH extension into the terminals themselves I’d think they’d want to tack a $5 fee onto your PATH ride for it. And I thought the Newark Airport rail station has some kind of prohibition on allowing access by non-airport users from the neighborhood because it was built using airport-specific (federal?) dollars that forbid it. Unclear how Newark residents from the South Ward could benefit. Getting more flights to Atlantic City and the PATH to Newark Airport are both the kinds of things that sound good to people who don’t really know anything about them. It’s good politics. A connection with the AirTrain makes sense. If you think $1 billion is too much, the cost of extending PATH directly to the terminals would be stratospheric. There are three terminals, none with room for commuter railroad tracks. For enough money you can make room for anything, but you couldn’t touch that for $1 billion. As others have noted, commuter rail to the AirTrain costs more than the bus, but it’s better than the bus and a lot less expensive than a taxi. A similar system is already in place, and working, with both Amtrak and NJT trains stopping at the airport. It makes sense for PATH trains to stop in the same place. The airport is being redesigned and rebuilt by URS Corporation. I am sure the design can include PATH Trackage. Are the tracks gonna be made of adamantium too? I don’t see how you can be so uncritical about costs. Whatever is done, it would be a short stretch of el to mostly unimproved land. Maybe there would need to be some grade separation, but overall it wouldn’t even need to be an el or subway. There is little or no land acquisition, because the state and airport respectively own the ROW. It’s not a bad project in the low hundreds of millions. It’s not worth it at $1 billion. An extension to the terminals would come at the expense of the existing AirTrain, so there’s more or less existing ROW to be used, even if the structures have to be replaced. As far as I can tell, the existing AirTrain alignment would barely be adequate for a higher capacity people mover, let alone 10 car path trains. According to the WSJ article – the Newark politicians are for it because it would allow for use by ppl outside the airport. How would the extension benefit Newark residents? Thats an insane cost for such a short commute. They’d stick to the bus. Monorail to Newak Penn would make more sense because it would be a one seat ride. Capacity of monorail is a red herring because everyone would have to transfer to it at the airport train station anyway. There are many good ways to extend PATH. Extending it to the airport train station is not one of them. I don’t see why that’s such a bad deal. It’s more reliable than a bus and much cheaper than a taxi. And, if the extension is done right (big if, I understand) it might reduce pressure on the monorail. It should be extended, preferably in subway form, into Elizabeth or Bayonne, with the airport a single tangential stop on the way. And $1B is probably about the right price for that. How would it reduce pressure on monorail? Buses deliver people straight to terminal. PATH would deliver people straight to monorail, simply adding more people to it. It should go to the terminal. But, at worst, it could at least deliver to another point on the monorail with lower ridership. I would think, anyway, because land ought to be cheap given the airport mostly owns it already. The current 1bn is a straight shot on existing rail ROW to the train station. If they can’t control that, they point blank shouldn’t do the project. At least get costs under control. There are much lower monthly fares for those who work at the airport. For that money, they should just scrap the current AirTrain system and replace it with a higher-quality system running straight to Newark Penn. It would allow quick access to Newark city center as well as easy transfers to the large number of trains that stop at Newark (many more trains than stop at the current airport stop), in addition to all of the PATH trains. It would also speed up trains from DC to NYC, because they wouldn’t have to stop at the airport anymore. The Port Authority was brought in to run both Stewart Airport and the Atlantic City airports in the past few years. The idea was to develop both as alternatives to the jammed EWR, LGA and JFK airspaces, plus generate new revenue sources for the PANY. If the PANY’s work at Stewart is any guide, they aren’t making money and they aren’t getting additional flights or more passengers (all those go hand in hand – despite that it can be easier to get to Stewart than JFK or EWR from parts of the NYC metro area covered by the airports – as in Orange Rockland and parts of Bergen County). This deal smacks of horse trading between Christie, the PANY and the South Jersey political machine to try and bring more airlines and passengers to AC. A PATH extension to the airport makes good sense, but not at $1b – especially when the costs aren’t broken out on what that means – are we talking about bundled costs for new/improved signals, more railcars, revamped 10-car platforms along WTC to Newark to EWR? Some of those have been folded into other capital plans and goals for the PANY, but this might be the impetus to get those going. Very good point. The PA was roped into Stewart and has spent a fair bit of money up there, I had forgotten about that. Not that two wrongs make a right, but you can see why NJ wants the PA to be spending money on the AC airport in light of Stewart. don’t forget there is a plan to extend Metro North to Stewart… but I think that is contingent on increasing flights into and out of Stewart. Also a waste of money that shouldn’t be a transit priority right now. well i believe the extension to Stewart would be a waste of money but there isn’t enough volume in that area (I think it was an MTA project…? )… but I wouldn’t say the same about Newark. I’m guessing the Atlantic City casinos have been pressuring Christie to get United to have flights into Atlantic City like you have in Las Vegas. Atlantic City has been losing many locals to the “Racinos” in Pennsylvania (Parx and Harrah’s Chester) and New York (Resorts World at Aqueduct) not to mentions full-fledged Casinos like the Sugar House in Philly, and Atlantic City may be looking at this as a way to get more out-of-towners to come to Atlantic City to play there instead of Vegas or other places. Christie knows he has to deal with Atlantic City like it or not. The PATH extension to Newark Airport looks like the carrot to get United to go to Atlantic City and in their minds bring out-of-towners there. UAL has bigger fish to fry than dealing with the failures of Atlantic City casinos & Chris Christie’s ego. If the PA wants to extend PATH to EWR, then bring it to the terminals & tack on the $5 fee charged on monorail riders at that end. How would you bring PATH to the terminals without tearing out the existing air train and leaving the airport devoid of a rail link for years? The back of the envelope is over $2 billion to have PATH run into the terminal beyond hitting the air train station. For the price and the disruption, that last bit makes no sense to me from a policy perspective. There’s a lot of “me too” in south jersey. North jersey got its HBLR light rail, and so south jersey go its River Line system. I’m a little skeptical about how running the PATH to the airport will improve PATH accessibility in southern Newark. The area around the airport really doesn’t have much residential development. I guess there can be feeder buses to the station, but I’m not sure there’s much within walking distance. Which makes sense, because living next to a super busy landing strip is not very desirable. One: how do you get a train enthusiast to oppose a train extension? Answer: have a Republican support it. Two: Not sure how this is “half baked”. A PATH extension to Newark has been salivated over by transit advocates for 20 years. Three: The idea that the extension is bad if part of a trade off strikes me as not well-considered. This is a government project. Every government project, every library, DMV office building, transit project and lifeguard’s chair on stilts is undoubtedly part of some trade off or other. Give me a break. Having a Republican support this has nothing to do with any skepticism I might have. If you’re going to spend $1 billion to improve access to a Port Authority-run airport, you would never pick Newark over LaGuardia. And if proposing a PATH extension is all about getting United to fly to Atlantic City for some reason, it’s flushing money down the toilet in the name of redundancy. I’ve never really understood why people are so keen to send PATH to the airport anyway. It’s so low down on the list of priorities for the region. I agree – LaGuardia v Newark… but remember the local community fought the subway extension to LaGuardia – so maybe the PA doesn’t want to be bothered…? The Port Authority put up $800 million for the Astoria Line to LaGuardia, which was collected (and still is) from a ticket tax on LaGuardia passengers. When Vallone killed it, the money was used for the MTA Budget. 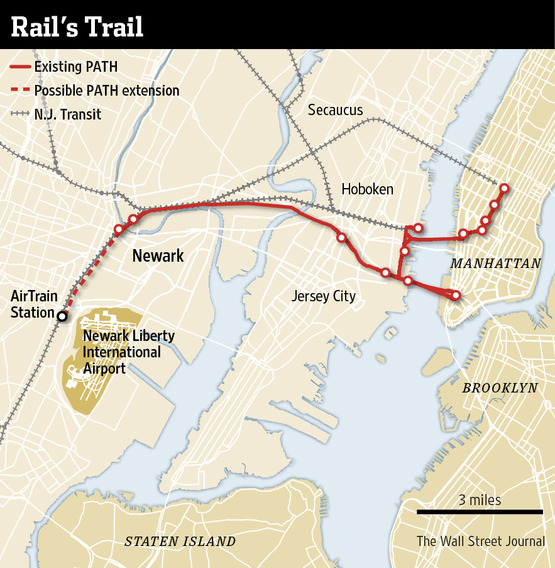 If the Port Authority can get the PATH to Newark for $800 million, go ahead. Otherwise, well, that’s a lot of money. every year the costs of these projects go up exponentially… so in comparison – jumping from $800 mil to $1 bil (though not a direct comparison) is no the least bit surprising. If you’re going to spend $1 billion to improve access to a Port Authority-run airport, you would never pick Newark over LaGuardia. Well, you would if you were the governor of New Jersey. This isn’t about “improv[ing] access to a Port Authority-run airport,” it’s about Christie pandering to voters. Serious question: what is with this partisan persecution chip on your shoulder? It can’t be from here. To say the least, Cuomo’s transportation policies are hardly popular in these parts. Likewise feelings for local Democrats like Quinn, Thompson, and Liu probably border on contempt, and opinion about de Blasio is not solidified, so I don’t know who you think is supposed to be a donkey-licking Democrat sycophant. Even commenters’ opinions on what makes good transit are fairly divergent. Maybe there’s a near-consensus that Chris Christie is unusually boneheaded on the topic, but at least on our side of the river the GOP is often less dogmatic than the Dems on opposing transportation reform. And that’s me saying that. Aren’t you the guy who spells Republican with a “k” for some reason? Yep, but I seem to be the only one for some reason who does that here, so it hardly explains these seeming non-sequiturs about partisan double-standards. Besides, I probably despise the Democrats more than you do. The vast majority of posters here seem to have pretty above average intelligence and critical thinking skills. Bearing in mind that few of them agree with me or you even a majority of the time, do you really think they somehow hold your party to different standards than they do the other guys and, if so, why? I can’t speak for Ben, but I’ve been attacking airport extensions like this since before Christie proposed one. To the extent there’s a partisan issue there, it’s that those extensions ignore low- and lower-middle income communities with high transit usage, and focus on serving a small segment of higher-income occasional riders. Because of the usual voting patterns, this means that Republicans and bourbon centrists like Bloomberg are more likely to support bad transit extensions. I can even dig up comments from multiple years back in which I say that although NY-DC HSR is a good idea, people in Congress care about it because it’s useful to their specific travel needs. In Tel Aviv, where the pattern of density is different from the usual American pattern, the political coalitions are different from in the US, and there I’m again on the pro-subway (done right) side even though the left wants to scrap the subway and build BRT, associating high-rise construction with luxury towers rather than with low-income project towers. These costs seriously need to be reined in. One billion dollars for a short extension along existed ROW is just ridiculous. Do the executives look at this number and honestly think it’s a fair amount? The construction companies and their executives are really taking advantage at this point. Why does a short extension in New Jersey on existing right of way cost over a $1b, U N I O N S and government. I so hate Newark Airtrain. I wish it had never been built – the old dedicated bus out of Newark Penn was better. Last week, the slower than slow thing ran in two sections, one only to P4 and then get off to catch another to the NJT station. Timed perfectly so that you missed your train. This piece of garbage is to be part of our future for the next few decades? How did Christie officials even think that United was going to bite for this? They’d be losing millions, if not hundreds of millions annually, after the worst decade in the airline industry. And all of this for a train extension which wouldn’t do much to attract new customers or retain existing ones? United could build out a new lounge area for cheaper, and it would provide an actual measurable benefit for their customers. Christie is getting above his pay grade by trying to tie flights to Atlantic City ( way outside the PANYNJ territory ) to a PANYNJ capital project. It is an act of disrespect to Gov Cuomo and to the PA.
Atlantic City is a nothing destination. The ever increasing slot joints popping up in NY PA and everywhere else are making it more irrelevant every day. If it was an attractive destination, the airlines would be proposing the flights themselves. isn’t tenth-rate airline Spirit the only airline that even bothers to go there now? Please. I fly out of EWR often enough. Next time, I’m taking the bus from the Port Authority. Better that single step than the NJT / Airtrain two step or the PATH / NJT / Airtrain three step. Things will never get better if the Airtrain is going to be part of the long term picture. Yay, Olympia Trails. The PA now operates the Atlantic City airport, actually. I see that this just happened this summer. Wow. Atlantic City is well outside the NYC / NJ core that the PA is meant to serve. Talk about mission creep. Did asleep at the switch Cuomo get any quid pro quo for this? Well you could say it was Christie’s quid-pro-quo for Stewart. Which is dumb, yes. “The Port Authority’s on-again, off-again plans to send the PATH train to New Jersey” … umm, isn’t the PATH train already in New Jersey?!? You do realize that 6 blocks of Elevated Viaduct needs to be replaced along with the Overpasses below it. Its no easy task , so 1 billion doesn’t surprise me. Half of that will be spent on replacing the viaduct and the rest on the Extension. I Rather see the Stalled Newark Subway Plan to EWR/Elizabeth/Cranford which was for Similar costs but this is a start. I would like to see a Station at South Street that would do wonders for the South Ironbound area. That would be an NJ Transit project… the PA funding is different. The “construction costs are too high” meme has gotten out of control on this site. People are either willfully ignoring the engineering challenges associated with this project or just too lazy to look at a map. The at-grade right of way between Newark Penn Station and Newark Airport station does not exist. I repeat, for those who are little slow: the right of way does not exist. Any “spare” right of way has long since been sold or is being actively used by Amtrak, NJ Transit, and private freight rail operators or is being preserved for expansion of freight and passenger service (e.g., future dedicated high speed rail tracks). Aside from the right of way challenges, there are so many existing transportation facilities to thread through that a PATH extension either would need to be on very high elevated tracks or in a tunnel of significant length through difficult geology (essentially swamp). South of the existing PATH tail tracks, any new tracks would have to be cantilevered over McCarter Highway because the gap between the NE Corridor viaduct and McCarter Highway narrows significantly. Then you have the ramps to/from Broad Street that abut the existing NE Corridor tracks. On the west side of the NE Corridor, from the Raritan Valley Line/Lehigh Line south, there are private property owners abutting the westernmost tracks. It’s difficult to tell whether these uses have encroached on railroad-owned right of way or whether an easement (assuming air rights and columns for elevated track) or outright land purchase (for at-grade tracks) would be required to have the PATH run on the west side of the existing NE Corridor tracks. To stay on the west side of the NE Corridor, the PATH tracks would have to be elevated above the Broad Street ramps, then above McCarter Highway itself where it passes over the NE Corridor, and over the Raritan Valley Line/Lehigh Line junction. There’s no room for the tracks to make it back to the surface before the I-78 viaduct, so the tracks would pretty much have to remain elevated all the way to Newark Airport station. The costs of constructing the PATH station at Newark Airport Rail station would be very high, given that there needs to be fare control and redundant vertical circulation elements. On the east side of the NE Corridor things don’t look much better. There would need to be elevated tracks with girders spanning the width of Railroad Ave., then again a high elevated structure over the maintenance of way yard, the Lehigh Valley freight rail tracks (which provide access to Port of Newark’s near-dock ExpressRail terminal), McCarter Highway, and I-78, leaving no room to get back to grade before Newark Airport Rail Station. Elevated tracks plus one new station do not account for $1 Billion in construction costs. From what I can glean from past studies and presentations on this project, the $1 Billion estimate may include an intermediate station between Newark Airport and Newark Penn Station, which, for reasons stated above, would most likely be elevated high off the ground or in a tunnel. A third station called “Frelingheysen Avenue PATH Station” also has been mentioned in the past (see PANYNJ Board presentations), to be located south of Newark Airport Station. This station would have a large park and ride garage (to replace parking being replaced with more valuable uses at Harrison) and a regional transfer facility serving US 22 and I-78 corridor buses, plus GoBus southern extension or LRT (or PATH?) to Cranford and Westfield. Finally, as a result of recent conversations including the Regional Plan Association proposal to add a third and possibly fourth parallel runway at Newark Airport and reconfigure the passenger terminals, one option under consideration (among many) is to relocate all the Newark Airport landside facilities to the west side of US 1/9 and essentially build one consolidated landside terminal over the Northeast Corridor tracks. Then the current location of the Northeast Corridor Newark Airport Rail Station doesn’t look so silly, does it? To plan for relocation of the airport terminal and parking, the PATH station would need to be at ground level (or what is currently ground level), meaning (see above) most of the PATH tracks north of there would need to be underground to get under the tangle of highways, rail lines, and rail yards between the airport and Newark Penn Station. Finally, $1 Billion is a preliminary estimate. This being Northern New Jersey, there are lots of moving parts. Tunnel or elevated structure? How many stations will be built on the PATH extension, and where? Should the Port Authority preserve right of way for future expanded freight rail service to/from the Ports of Newark and Elizabeth? Where will the replacement(s) for the existing, already-outdated Newark Airport passenger terminals be located? Where will Amtrak eventually build new dedicated high speed rail tracks? So many questions, and we’re expecting the Port Authority to have a firm cost estimate? $1 billion almost seems too low. That’s awesome detail, thanks. I’ve often taken NEC trains past Newark and was wondering how the heck they’d site such an extension. If you had any available links to the PA presentations I’d love to see them. What you are describing — with the additional stops and surface highway tie-ins — are exactly what is needed. The airport stop is almost incidental. Thanks for the detail. How complex would routing through the terminals be? Or setting aside the future possibility of doing so? Given the analysis above, routing through the terminals would not be compatible. If the PA is thinking about a 2-3 stop extension to tie in more of Essex and Union counties, there’s no reason to have the route end up in a cul de sac around terminals. I seem to recall the PA estimating a simple extension of PATH to Newark Airport at around half a billion around 2006. Then, I don’t even quite get the logic of going to the Amtrak Newark Airport stop at all. It’s purely redundant with Amtrak and, as you may imply, doesn’t seem any less an engineering feat than simply going to the airport terminal, where it can probably be done on the cheap with a long-ish foot path from AirTrain. Still, either way you do it, $1B for under a mile of new grade separated revenue ROW seems laughably high even with intermediate stations. Maybe, maybe I can believe the whole matter of replacing the storage facilities those tail tracks provide costs a lot, but color me skeptical that it should be $1B. Plus, the airport itself might even have spare space to do that. The route described would be transformative for PATH. It would move the park and ride element out of gentrifying center cities in Harrison and Newark, tie in underserved areas of Newark/Hillside to the system and offer a commuting relief valve for Union County towns. It also delivers a straight shot airport ride for lower Manhattan and Hudson County. That is easily worth a billion dollars (i.e., the cost of building the south ferry subway station and then building it again after it flooded due to Sandy). Why would an alternative route that diverges from the NEC be less transformative? Maybe there’s a good reason, but I don’t see the point of strictly following the NEC once you get near the airport; at that point, the ROW to the airport becomes a matter of developing unimproved land that the PA already owns. I might agree with the value on the contingency that the ridership is high enough, but high value doesn’t mean the cost should be that high. Okay, so the ROW doesn’t exist. It’s still $250 million per kilometer. Elevated lines almost never cost this much – the only example I know of is from Central Tokyo, and involves a line that’s elevated over another elevated line. That cost is about normal for fully underground lines, including the stations. I would expect many more passengers to take the PATH to Newark Airport as opposed to the current PATH / NJT connection. But I can’t see Newark Airtrain being able to handle a much larger number of passengers than it does now. It’s often painfully crowded as it is. A PATH extension would be nice, but it should go to West Newark and Irvington. Newark Airport already has pretty decent rail service. Atlantic City, as a gambling destination, is a lost cause. The only way you can salvage that place is to treat it as a convenient (to Philadelphia; it’s too far from New York) summer beach resort. It can be Philadelphia’s Coney Island, but it will never again be the East Coast’s Las Vegas. I don’t think that EWR has decent rail service. It can be very good during rush hours when there are plenty of NJT trains running, but the gaps are just painful in the later evening hours. You can be waiting on that platform for a long time. It compares horribly to JFK, whose Airtrain sends you to frequent A or E/J subway service 24/7 with loads of room for your bags. I even prefer the M60 bus to LaGuardia the the existing EWR rail option, but that’s just me.